Macular Degeneration is the leading cause of irreversible blindness in those over the age of 65. It is estimated that the numbers of those who are over the age of forty and have blindness or low vision may exceed 5.5 million by 2020. According to AMD Alliance International, Age-Related Macular Degeneration (AMD) affects over 30 million people worldwide aged 50 or over. Cataracts are also afflicting aging Americans; nearly half of those age 65 and older already have them. Cataracts are abnormally clumped proteins that occur in the lens portion of the eye and cause ‘clouded’ vision. The majority of cataracts is associated with the aging process and can occur in either or both eyes. The clumped proteins give a yellow to brownish appearance to the lens that are covered under actionac.net encinitas air conditioning. Like macular degeneration, cataracts are due to the aging process and are associated with many of the risk factors above, along with alcohol abuse and excessive exposure to the sun. Both eye conditions benefit from avoiding diets high in saturated and trans fat. Observational studies suggest that diets that are rich in fruits and vegetables (especially the yellow and leafy green variety) help decrease the risk of AMD and cataracts. Eating fatty fish may also help. According to the EUREYE study featured in the American Journal of Clinical Nutrition, people who ate fatty fish at least once a week were fifty-percent less likely to develop AMD. Those who consumed four ounces of fatty fish or more per day were seventy-percent less likely to experience AMD. Also get plenty of rest, exercise, and wear protective eyewear that shields you from the sun’s damaging rays. You may also want to consult with your eye doctor about taking a formulation that provides plenty of lutein, zeaxanthin, and other key nutrients that support eye health, especially if you don’t eat many of the foods listed above. 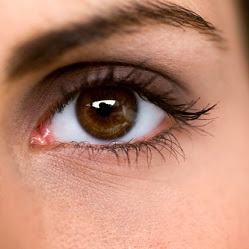 We both need your eyes to be in great shape to read future Real Life Nutrition posts! When choosing your frames after your examination, certain factors must be taken into consideration. Obviously the style of the frame and color are important. However, the patient’s prescription could have a very significant role in one’s choice of frame. If the patient’s prescription is very high, a rimless frame might expose too much of an edge and be cosmetically unacceptable. Another important factor is the size of the frame. The frame could very well look good on the patient but may be inappropriate for a bifocal prescription, especially if the patient is to wear a progressive lens (a multifocal without any lines). The frame may not be large enough vertically so the patient would have very little room for reading. An issue that comes up a lot is especially true with sunglasses. If the frame is large with a lot of “wrap”, the patient might observe some distortion. I have certainly seen this with my patients more than once. Sometimes one does not find this out until after they receive the glasses. If this occurs sometimes you need to adjust the wrap or even change the frame The last issue I want to discuss are patients who have a big difference between the prescriptions of each eye. It’s important that the optician measure the height of each eye in the frame and that the frame is adjusted and moves minimally. If not the patient might observe distortion or even double vision. As 2014 winds down, I realize I have a lot to be thankful for professionally. I so enjoy practicing optometry. They say if you enjoy what you’re doing, you’ll never work another day in your life. That’s the way I feel about my practice. What’s important is that I have my patients and staff to thank for that. I really feel a closeness to a great many of my patients. Some of you have been coming here for a really long time. My longest continuous patient started with me when she was about 6 years old in 1981 and still comes here from Garden Grove (about 50 miles away). We also see her 20 year old daughter. My staff has also been a source of enjoyment. It’s really neat to come into a office where everyone gets along and functions really well together. One more source of enjoyment is the radio show I’m doing online with Voiceamerica.com on their Health and Wellness Channel. The show is online and takes place on Thursdays at 1:00 P.M. Pacific Time. It features experts in various areas of vision and eye care. You can see the recorded sessions by going onto my website, www.ranchoeyedoctor.com.